Seats are rotationally molded and made from Surpass materials. 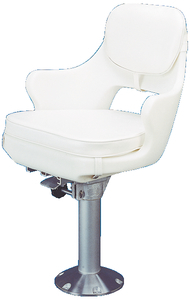 Includes seat, cushions, 15" anodized aluminum pedestal and manual slider. White. Seat dimensions: 17-3/4"D x 21-3/4"W x 18-1/2"